Following on from my previous post, I’ve been looking through my photos of Royal Albert china to showcase a selection of them. 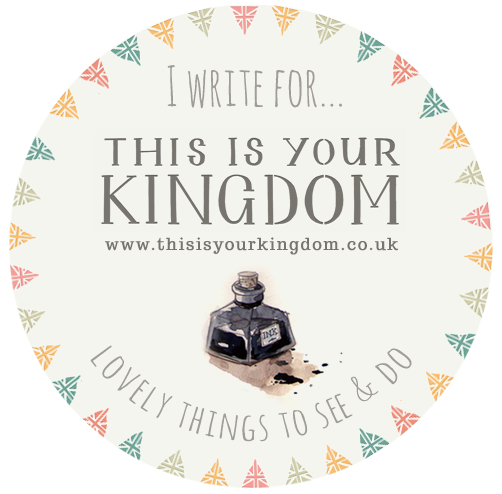 I love looking through my photos – it reminds me of where the pieces have gone – often half-way across the world to enthusiastic customers who each have their own story to tell behind their vintage china collections (some of which I hope to share in the forthcoming months!). I’ve learned that you can tell a lot from the small maker’s mark (or backstamp) on the bottom of a cup or the back of a plate. They are particularly interesting for a company such as Royal Albert, which has had such a long history so it’s relatively easy to trace where a piece of china fits into the company’s story. 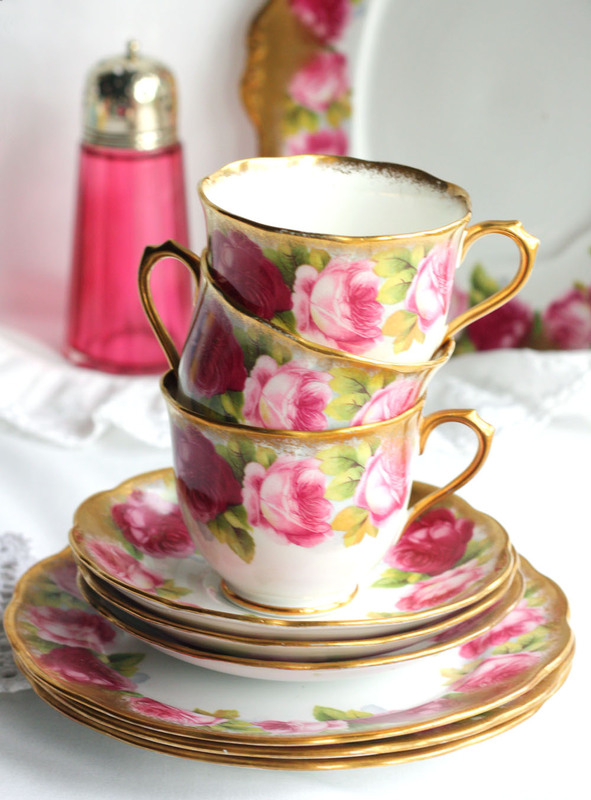 This Old English Rose tea set has such beautiful pink and gold tones. One of my favourite Royal Albert designs is a forerunner to Old Country Roses, the softer-patterned “Old English Rose” which dates from the early 1930s. As I explained in my earlier post, the company was first known as Albert Crown China and its Crown China backstamp was used from 1927 to 1935 and did not include the pattern name on the bottom of the china. The sets that I found were from this period and examining them made me realise what beautiful china was being made back then. The stout cups have a simplicity to them that seems to balance perfectly with the rich pink and gold tones. 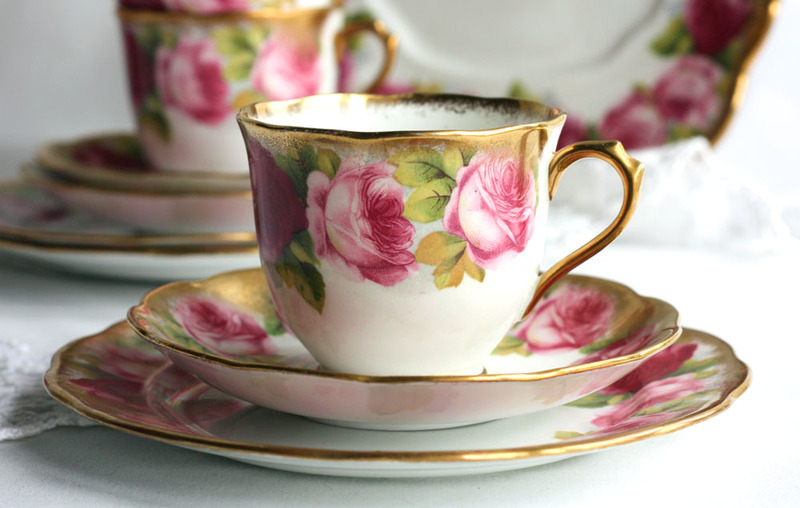 The same pattern was later re-produced with a lighter gold after World War II and called “Old English Rose”. The name of the pattern was then added to the backstamp. Earlier pieces like the ones I found are now quite rare. All of these tea sets are now sold – one went to Argentina, two ended up in Australia, others went to Alaska and one stayed in the UK. I’ve been looking for more of it but no luck yet! I enjoy photographing my china almost as much as finding the pieces. I find lots of inspiration for my photos from other shops on Etsy and great help articles on Handmadeology. 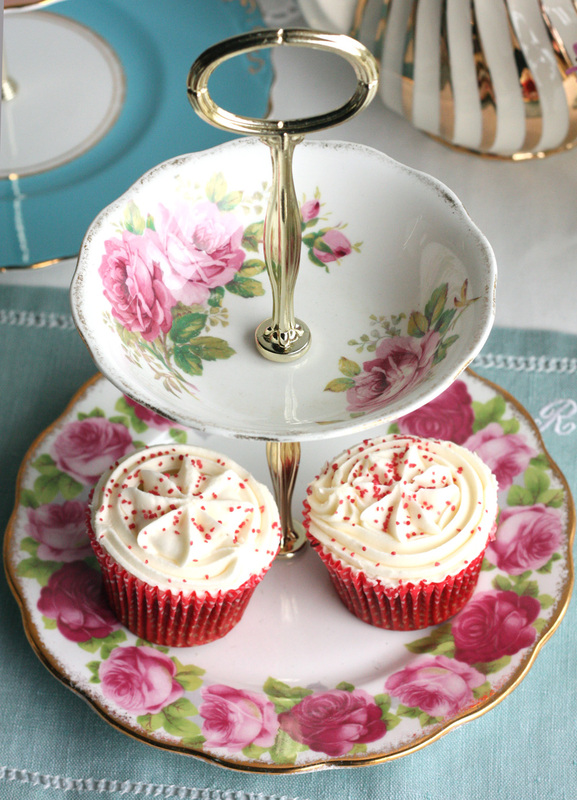 This two-tier cake stand with the Royal Albert American Beauty bowl on top and Old English Rose plate on the bottom could be used for cupcakes, sweets, or other little snacks!